Want to learn how to crochet? 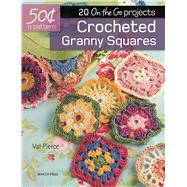 Make a granny square on-the-go, and at only 50 cents a pattern. The simple techniques have lasted for decades and now they are trendier than ever. With endless color and size variations, creating these hip squares is fun and easy. They can be used like building blocks and combined with other squares to make original projects and gifts, or used to embellish larger items. This book will show how to create 20 different squares, including flower patterns, interpreted in different colors and yarns to create a kaleidoscope of effects. Also included are projects that show the reader how to make their squares into a simple baby blanket, arm warmers, a purse, a pin cushion, a mug cozy and a stylish pair of boot toppers. Val Pierce’s passion for knitting began when her father taught her to knit at the age of five. Later in life she began home knitting for yarn manufacturers, and since then she has made a huge range of items, from evening dresses to teddy bears. She later began redesigning items of her own, and before long Val’s designs were appearing regularly in national knitting and crochet magazines. She also teaches knitting, as well as a range of other needlecrafts, to both adults and children. Val lives and works in Shropshire.